If you’re into YA genre this book is perfect for you. Predictable in parts, but not in others. I appreciate that Wildenstein kept this book honest all the way through. She didn’t try to make us feel better at the end and protect her readers from real life as so many others do. If I have any complaints, I suppose that I wish she had left out some of the smaller side-stories and focused more on Ghostboy. 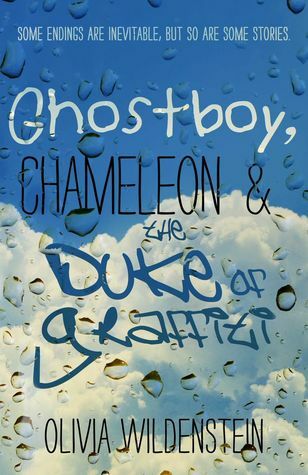 The concept of “Ghostboy, Chameleon & the Duke of Graffiti” was brilliant. I absolutely loved it and how it came about. I feel the smaller side-stories going on with all of the friends, perhaps took away from the main focus of this novel. It’s not that I minded them. I just felt at times that we could have better understood the connection between Ghostboy and Duke and Chameleon if we had more time to share with them and to see the relationship develop. I would have liked to see another 200 pages of the adults in the story and the three main characters….